Designing the QS was a dream come true for the development team. The goal was to make the best featu..
AMBIENT QXS 580 CCM .. Designed by Ambient Recording, the QP 4140 Feature-Film Boom Pole extends up to 17' l.. Solid hook, made from strong ABS, to rest your boompole in between takes or in a situation when you ..
Boompole Holder to insert on a Stand with a GOBO head, we have used them for years and the durabilit..
CINELA COSI HLD- COSI-HLD-19 (19mm diameter mikes, like DPA, MKH8000, CS-M1…) - COSI-HLD-20&n..
CINELA COSI LCOSI-L-21 (MiniCMIT, Long cage, 21mm mike diameter, Long cable)COSI-L-20 (Schoep ..
CINELA COSI MCOSI-M-19 (Sanken CS-M1, Medium cage, 19mm mike diameter, Long cable) ..
CINELA COSI SCOSI-S-19 (MKH8050, DPA4018C, Short cage, 19mm mike diameter, Short cable) ..
Set of:- 1 plastic isolator C3 (Front) + screws- 1 plastic isolator D3 (Back) + screws- 1 pair of ru..
OSIX 2-416 is an adaptation of the OSIX 2, for the Sennheiser MKH 416 or KMR81, with harder isolator..
OSIX 2 has been designed for the SCHOEPS microphone, comprising a CMC 3, 4, 5 or 6 body and a COLETT..
OSIX CMIT is an adaptation of the OSIX 3, for the new Schoeps CMIT 5 microphone.With the benefit of .. Rain Cover for PIANO windshieldFully surrounding. Thick layer (3 cm) of large open cell light foam. ..
Windshield for short shotguns...or any mono mikes shorter than 21cmThe Reference PIANI-1 is composed..
Windshield for half shotgun mikesSchoeps CMIT 5UDPA 4017BThe Reference PIA-1 is composed o.. This K102 Klassic Boom Pole has a collapsed length of 2’3″ (69cm) and an extended length of 8’5″ | 2.. This K102CC Klassic Boom Pole has a collapsed length of 2’3″ | 69cm and an extended length of 8’5″ |.. This K123 Traveler Klassic Boom Pole has a collapsed length of 2’6″ | 76cm and an extended length of.. This K123CCR Traveler Klassic Boom Pole has a collapsed length of 2’9″ | 84cm and an extended length.. This K152 Klassic Boom Pole has a collapsed length of 3’0″ | 91cm and an extended length of 12’8″ | .. This K152CC Klassic Boom Pole has a collapsed length of 3’0″ | 91cm and an extended length of 12’8″ .. This K152CCR Klassic Boom Pole has a collapsed length of 3’5″ | 104cm and an extended length of 12’9.. This K202 Klassic Boom Pole has a collapsed length of 3’10” | 117cm and an extended length of 16’10”.. This K202CC Klassic Boom Pole has a collapsed length of 3’10” (117cm) and an extended length of 16’8.. This K202CCR Klassic Boom Pole has a collapsed length of 4’1″ | 124cm and an extended length of 16’1.. This K230 Traveler Klassic Boom Pole has a collapsed length of 4’2″ | 128cm and an extended length o.. This K251 Klassic Boom Pole has a collapsed length of 4’7″ (140cm) and an extended length of 20’9″ (.. 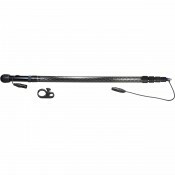 This K251FT Klassic Boom Pole has a collapsed length of 5’4″ (163cm) and an extended length of 21’5″.. This K81CC Klassic Boom Pole has a collapsed length of 2’0″ | 61cm and an extended length of 6’9″ | .. This K81CCR Klassic Boom Pole has a collapsed length of 2’3″ | 69cm and an extended length of 7’2″ |.. This K87 Traveler Klassic Boom Pole has a collapsed length of 1’10” | 55cm and an extended length of.. This KA113 Articulated Klassic Boom Pole has a collapsed length of 2’2″ | 66cm and an extended lengt.. The boom cradle supports a boom pole and attaches to a grip stand knuckle with a stainless steel spu..